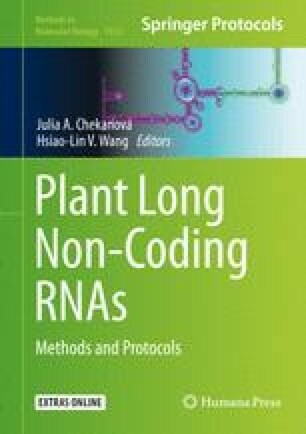 Plant lncRNAs are expected to play important roles in various plant processes including response to abiotic stress, although the functions of most plant lncRNAs are still unknown. To investigate these potential functions, integrated approaches that employ genetic, transgenic, and molecular biology methods are required. Here, we describe general methods to study the function of lncRNAs in plant response to drought and salt stresses. First, the expression pattern and subcellular localization of lncRNA are analyzed by GUS staining and RNA fluorescence in situ hybridization (FISH). Then the responses of lncRNA mutant and overexpressing transgenic plants to drought and salt stress treatments are characterized, and their sensitivities to ABA are also assayed. To understand the molecular mechanism of lncRNAs’ function in stress response, transcriptome sequencing (RNA-seq) and real-time quantitative PCR are performed to analyze altered expression of stress-related genes. Finally, proline content and ROS content are measured to reveal the accumulation of osmolytes and second messengers in these plants in response to drought and salt stress treatments. This work was supported by Texas A&M AgriLife Research Center at Dallas and by King Abdullah University of Science and Technology to L.X.